Among the many types and styles of work, we were intrigued by some Newspaper related works by Francis Quirk. The first two watercolors appear to be of the same man- an Editor or publisher of a paper. 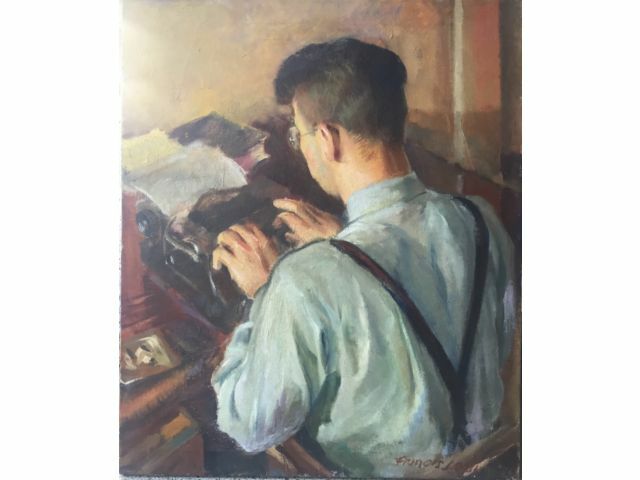 The oil painting of the young man typing recently was offered for auction on line and that spurred us to moving forward with this post. Francis J. Quirk Watercolor of a man in the Newspaper trade. The painting above has some interesting subtle features. Note the window with the birch trees and reflection of the man. The desk is littered with papers, cokes and a thermos (of coffee?) His tie is down and his sleeves are rolled up. With two phones, this is a man with an active day. This watercolor of the man standing is showing him in a commanding presence. The man in the background is almost in a deferential pose. The tools of his craft are prominently displayed- the black rotary phone, typewriter and in-out baskets. There is no email here! This painting recently came up for auction and we have included it in the Newspaper post.